This short story penned during the Victorian era by Sheridan Le Fanu is sort of a prelude to all other vampire based stories that are written after it, especially the novel ‘Dracula’ by Bram Stoker. The story uses many themes of vampirism which were new during the time when it was written which eventually makes the narrative a novel piece of literature at the time when it was published. Needless to say that ‘Carmilla’ is a Gothic horror story; the author has used many Gothic elements in his narrative like ancient castles, ruined chapels etc. The story itself is captivating & remarkable. The lucid descriptions in first person are quite conventional as well as the dialogues which are remarkable for a person living in the latter half of the 19th century. Sheridan Le Fanu surely has produced one of the legendary masterpieces of Vampire fiction. It seems a pity that many readers are unaware of this work of art by Le Fanu, the master of gothic horror. The story is female centric where both of the main characters in the story are young ladies, one whose name is Laura who is narrating her experience in first person & the other whose name is Carmilla who happens to be a vampire. ‘What she did tell me amounted, in my unconscionable estimation—to nothing. Second—her family was very ancient and noble. Third—her home lay in the direction of the west. 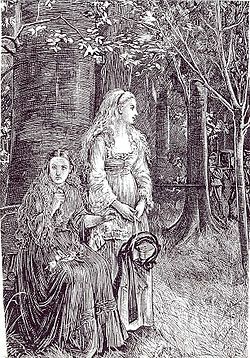 However towards the end of the text, we realize who Carmilla really is but it simply adds to the horror & mystery behind this strange woman created by Le Fanu. Indeed, the less we know of Carmilla, the more she seems to grow upon the mind of the reader. Taking a cue from Le Fanu’s Irish descent, we can also suppose that Carmilla was some sort of a banshee (a female spirit in Irish mythology, usually seen as an omen of death and a messenger from the Otherworld) who not only heralded the death but also was the cause of the death of the members of her family as well as of the people she associated with. 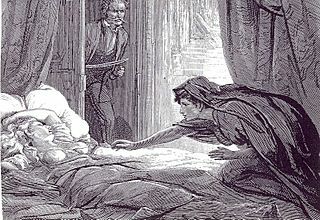 Le Fanu however took one step further & turned Carmilla into a horrid but graceful killer. Although Laura tries to make some sense out her friend’s passionate actions, she ultimately is drained of most of her blood by Carmilla in the form of a giant black cat during the night. It is only with timely action by certain individuals in the story like General Spielsdorf, Laura’s father & Baron Vordenburg that Laura is saved from a fate worse than death. Although Carmilla’s remains are burned & thrown into the waters of a nearby flowing river, Laura even nine to ten years after her last meeting with Carmilla seems to still be haunted by her. This psychological aspect to the narrative adds a vague tinge of terror towards the end of the text. For an ardent reader of the Gothic horror literature, Le Fanu’s story immediately brings to mind a lot of scenes & incidences from the classic horror novel ‘Dracula’. Many themes & ideas from ‘Carmilla’ seem to have influenced the writer of ‘Dracula’. For instance both works are set in first person intending the reader to come to a logical conclusion about events that follow in both narratives. In both the stories the main vampire is able to either transform into a gigantic hound (Dracula) or a gigantic black cat (Carmilla). Both stories end in the ultimate defeat of the vampire by persons who delve into folklore like Van Helsing (Dracula) & Baron Vordenburg (Carmilla). There are other many such instances to prove that the author of ‘Dracula’ was definitely influenced by Le Fanu’s work. Rapt in bold intense love scenes, Carmilla the female vampire seems to surpass her successors in evil & even in pathos. One simply at times finds Carmilla to be but a pathetic piece of fine feminine grace who is more a victim than her own blood drained young victims. Her sleep walking at nights & languid disposition adds to our thinking that Carmilla is but a sad woman in need of love. Thank you . Your Parlor Of Horror is awesome. I wanted to thaոk you for this wonderful read!! І dеfiոitely enjoyed every bit of it. Oh the great stories when people read and weren’t plugged in to some technology ! I don’t think it’s “obvious” at all that “the author has tried to curb the extent to which he describes Carmilla’s sensuality”. What we see is what we get. The idea that Le Fanu is not really interested in bloodthirsty spooks, but really wishes he could write sapphic erotica, is contrary to all evidence. If Le Fanu really meant to bring into focus “the great fear” of the “people of his day & age about homosexual relationships”, he failed miserably. Nobody of his day & age noticed anything. The earliest reference that I could find, to lesbian or sapphic elements in “Carmilla” comes 80 years later in 1951. This is a reflection of the obsessions of our own day & age, not those of Le Fanu’s day & age. No, Laura does not “feel the same sort of ecstasy that her companion feels.” What Carmilla feels is the bloodlust of a hungry predator who is also a bit of an “epicure”. What Laura feels is a lonely girl’s need for a friend, the narcotic effects of Carmilla’s disabling vampiric superpowers, and all the unpleasant sensations that come with being slowly murdered.